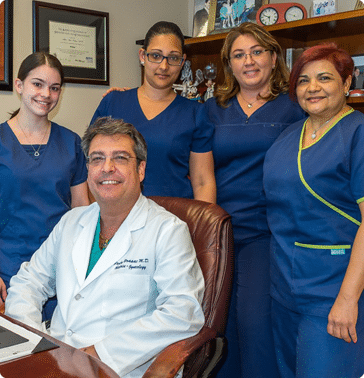 The friendly staff at Doral Beach OB/GYN welcomes your call and looks forward to serving you. If you have any questions about our obstetrical and gynecology services, please call our office in Doral or Miami Beach. To schedule an appointment, you can call us or use our secure online appointment request form. We also offer same-day appointments when needed. Our Miami Beach office is located on the campus of Mount Sinai Medical Center, easily accessible from the Julia Tuttle Causeway (I-195/Route 112). Our Doral office is located just west of Miami International Airport, at the corner of NW 41st Street (Doral Blvd) and NW 97th Avenue, on the second floor of the HSBC Bank building across from Publix. Our office is easily accessible by several major roadways, including the Florida Turnpike, Palmetto Expressway (Route 826) and Dolphin Expressway (Route 836). If you have an urgent medical need and need to talk to our doctors after our regular hours, please call the office you normally visit. A doctor is on-call 24 hours a day for deliveries and emergencies. Your call will be returned promptly. At Doral Beach OB/GYN, we accept Medicare and most major insurance plans. Please contact your insurance company or you may call our office to find out if we accept your insurance plan. If you have a question related to your bill or insurance, please contact our billing specialists. Doctors at Doral Beach OB/GYN are affiliated with Mount Sinai Medical Center. Prescriptions and refills for established patients of Doral Beach OB/GYN are routinely issued during our regular office hours (see above). You can make your request by calling our office at (305) 532-1989 in Miami Beach or (305) 477-7475 in Doral.